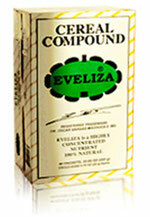 Eveliza: Nutrient concentrate for the recovery of food-conditioned illnesses - natur-apothekes Webseite! Range of application: Eveliza should be taken if the organism shows signs of decay (illness treatment by optimised nutrient balance in the cell system). In comparison to Alen, Eveliza owns a still stronger active strength in natural, biological substances. - Eveliza exists of grain, vegetables and seaweeds. Andes and the Galapagos Islands. - They show extremely high nutritional values and energy values. - A unique nutrient spectrum from 20 minerals, 20 vitamins and 18 amino acids. - Biological production (control after German standards). Minerals: Calcium, potassium, iron, magnesium, manganese, sodium, phospor, silicon, zinc a.o.m. Amino acids (17): Alanin, arganin, aspartic acid, cholin, glutamine acid, glycine, histidine, inosit, isoleucine, leucine, methionine, phenylalanine, proline, serin, thyrosin, tryptophane, valine. Use recommendation: In the morning and in the evening stir a little bag (20g) into quiet water or juice and drink it immediately.